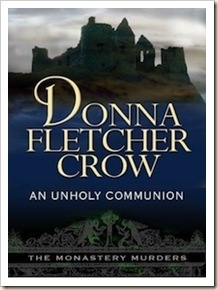 I was recently offered the book An Unholy Communion by Donna Fletcher Crow. This book is the first I have read by Ms. Crow, however she has written over 35 other novels. I can normally pick up a book and get right into it. Sometimes I may not love the book but can still manage to stick with it to the end. Honestly this book was one of the hardest ones I have picked up in a while. There was simply far too much detail about everything, I got lost in the details and was really not sure how it was relevant or what was going on. My feelings may be because I have not read the other two books in this series as well, I am not sure. It is clear the author is passionate about her books and the time she takes to thoroughly research is evident. This story is a thriller, as a murder is witnessed by Felicity, but the authorities believe it was a suicide. Her fiancé Father Anthony helps Felicity dig into the details surrounding the death and figure out just what happened. This book is well written, just not my style of writing. I am sure many people would be intrigued by the level of detail that Ms. Crow offers. NOTE : I was offered a copy of An Unholy Communion at no cost, from Litfuse Publishers, in exchange for an honest review. This looks like an interesting book. Thanks for the honest review. BTW–I have 7 giveaways running at my site if you want to stop over and take a look. Hope you have a wonderful week!